This is an 'oldie but goodie' from my files back from 2005 when I lived in Omaha, NE. 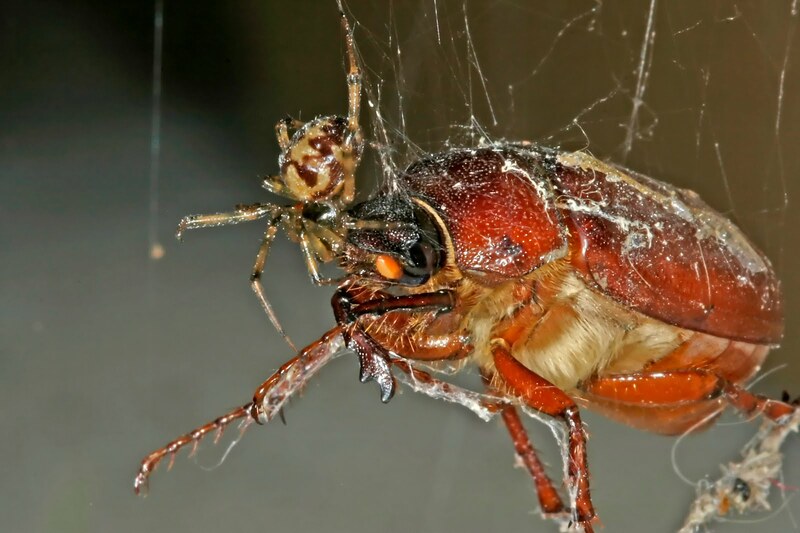 One evening I spotted a beetle (a Phyllophaga species, aka June Beetle) struggling in a spider web in my garage. It was a large beetle - maybe 3/4 of an inch. Having caught my attention, I figured it would be a good subject for my burgeoning photography hobby. I snapped a few photos and while getting set up I immediately noticed a small Cobweb Spider (perhaps Steatoda triangulosa per feedback on Bugguide) feverishly attempting to sedate the beetle. Quite an amazing site to watch! Now, my interest back then was not what it is today, so I spent maybe 5 or 10 minutes watching and photographing, and never checked back to see how it all 'turned out', though I must say it didn't look promising for the beetle. Update: I mistakenly hit 'publish' on this post when I meant to schedule it for a future date and edit it further. I made further edits to this post today, Sunday Feb 20. And be sure to check out the Macro Monday share for more nature (and other) macro photos from around the world. Against my better judgement, I enlarged this picture: gruesomely beautiful. Homeric struggle. And the difference in their sizes is astonishing. This is an awesome macro, I love it! the picture I mean , not the beetle and spider. GAH! Gives me the whim whams! But what a great macro!